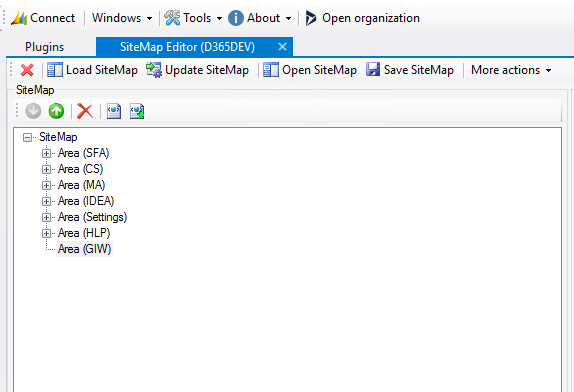 Yes, the Update SiteMap seemed to work fine, and exporting and checking the SiteMap solution XML showed the configured Area. 1. The Area structure is incomplete. I understand the thinking behind what was attempted. You would create the SiteMap “container” if you will, and come back to it later and populate it when you have all entities created. Well, if you want the container to show on the navigation, you need to create both the Group and SubArea. You can do a random name/title until you have your entities created. Interesting enough, the new Area does show up in an entity properties so you can configure it to show there. If no Title is provided, it will use a default UnknownXX nomenclature. Advice handed down: don’t rush! Strategy recommended: create your configurations first, then come back and update the SiteMap last. While a top-down approach might seem ok, you have to put “placeholders” until you have the configurations in place if you want the SiteMap to reflect your settings.